Advancement on the concepts and techniques presented in Program I, with the express purpose of offering new ideas to combat several key strength, fitness and sports dilemmas. Comprehensive discussion of the key biomechanical, physiological and psychological adaptations needed to perform advancing Bodii principles. Additionally innovative proprioceptive exercises are again offered for the more serious, dedicated and above all, inquiring participant. Adaptations of Bodii strength and fitness training. 1. Awareness of the principle of Specific Instability. 2. Awareness of the Weight/Load Differential. 4. Awareness of the retracted shoulder/scapula. 5. Awareness of hip/pelvis stability by including the muscles of the peripheral core. 6. Deliberate functional maintenance of the vital inclusions. 7. Awareness of re-inclusion principles. 8. Increased awareness and understanding of progressive adaptation. 9. Awareness of improved training co-ordination through advancing progressions. 10. Greater appreciation for core involvement in all movement. 11. Psychologically stimulating and challenging. Biomechanical adaptations of Bodii training. 1. Deliberate inclusion of the active lumbar curve. 2. Deliberate inclusion of retracted shoulder/scapula. 3. Adapted ability to include the peripheral core muscles. 4. Improved flexibility/mobility of the lumbar curve. 5. Improved incidental maintenance of the spinal curves. 6. Improved spinal/postural health through greater mobility and range. 7. Greater stability through hips and pelvis. 8. Improved balance and co-ordination. 9. Significant overall functional outcomes. 1. The Incidental and Deliberate Inclusion Cycle. 2. Delivers continuing strength adaptation success. 3. Physiological adaptations desired by women from strength training. 4. Physiological adaptations desired by men from strength training. 5. Physiological adaptations desired by athletes from strength & fitness training. 6. Bodii may be performed to great effect even with reduced resistances. Core strength and the Phases of Engagement. Examples of Ballistic Core progressions. Two ball bounce to platform. Specialised Bodii concepts and techniques. 2. Training the oblique core. 3. Core training on gradients. c) Left & right oblique profiles. 4. Bodii prone core-ball bridge. 5. Push-up/hover/two leg core-ball mountain climber. 7. Single alternating arm/leg core-ball hover. 8. Single arm oblique core-ball hover. 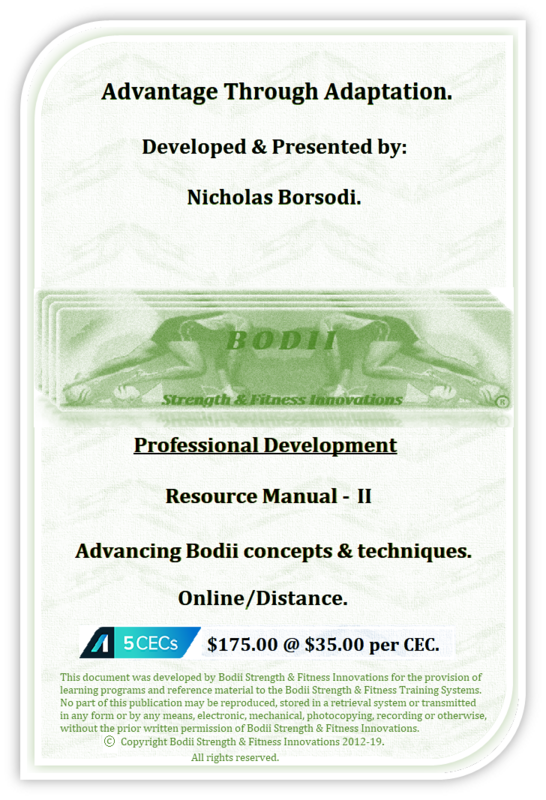 Preview of Bodii Program III.